Looking For A Hornchurch Car Shop? 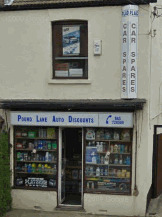 If you need a Hornchurch car parts and spares shop and don't know where to go, then do not worry anymore. Pound Lane Auto Discounts or "Car Spares Essex" as we are known online have been supplying low cost and reliable parts to the Essex motorists for the last 30 years. Since 1981 when we first opened our doors for business, our customers have flocked to us. Well actually they didn't on the first day, as we didn't have one customer! But things have certainly changed since then, which has made us the motor factors of choice for residents of Hornchurch and its surrounding areas. But what can we offer to you that hopefully will make you consider whizzing down the A127 from your home in Hornchurch to join our band of happy customers. As you can see from the advert at the top of the page, there is no need to struggle ever again to keep your car ticking over. With over 150,000 parts available to check prices and of course order for collection in our store, you can plan your weekend jobs to perfection. But if you cannot find the item online then you can also contact us on 01268 728309 or by completing our easy to fill-in order form. You see being around the motor trade for over a quarter of a century means that we have built up a huge network of friends who can help us find those difficult parts. So don't drive around desperate to find your spares. Just contact us and we can either get the part, or advise you of breakers, mechanics or other car shops where you can get it....if we can't. And believe me, that is not very often at all. So What Makes And Models Do You Supply Parts For? We supply parts and spares for all the most common vehicles that you will see driving around the streets of Hornchurch everyday. The Fords, Volkswagens, BMW, Peugeots and Vauxhalls all have stock sitting on our shelves ready for a sale. That is not surprising really, and is just what you would expect. But where Pound lane Auto Discounts has excelled over the years, and brings customers from across Essex is the older models. Classic cars, imported vehicles or the half built kit car sitting waiting in your Hornchurch garage can all be catered for too. From old distributors, ignition parts, exhausts, and radiators to oil filters, and spark plugs we really have it covered. So once again, hopefully you can see that Pound Lane Auto Discounts quite rightly claims the name as the number one car spares shop in Essex. Let us show you in person just what we can do. The list below shows the vehicles that we have very little difficulty supplying parts and spares for. Do You Deliver Parts To Your Customers In Hornchurch Essex? No we don't deliver although we would love to offer this service to all our customers. The reason for this, is purely down to focus. Being a family run business, we don't have the capability, and have to focus our energies where we feel they can do the most. And that is dealing with our online orders, face to face to customers, and of course those busy, busy phones. This Sounds Good So Whereabouts Are You? Well we are certainly an easy drive from Hornchurch that's for sure. You can see in the map below, that we are extremely convenient for most of Essex, due to being so close to the three main routes through Essex. The A127, A130 and the A13 are literally a stones throw from our premises just outside of Basildon. For directions to our shop you can check out more information here, or if you prefer to use Google maps then click on the link below the image. You can then enter your Hornchurch postcode for step by step driving instructions.